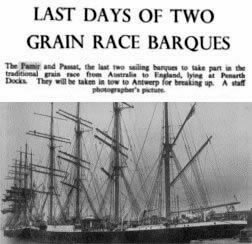 'On arrival at Falmouth (Pamir) and Queenstown (Passat) respectively, the barques were ordered to proceed to Penarth, my boyhood home town in South Wales. The Passat arrived first but I lacked sufficient courage to 'mitch' school in order to see her come into port. The following Saturday (6th October 1949) was a fine Autumn day and that is when the Pamir arrived. Along with a few of my school mates, we saw her locking through the harbour basin and into the dock where she passed her near sister Passat on her starboard side. The Passat still had her crew on board and so when the barques passed, both crews gave three resounding cheers for each other's ship. Even after 65 years my memory of this is as clear as a bell. Apart from proceeding to and from their respective discharging ports (Barry and Avonmouth) the barques were to remain in Penarth for about 18 months. During the early days of their stay with us, we small boys spent quite a lot of time on board. Both ships were alive with rats which could be seen scurrying about the decks and so we lads were appropriately armed with air-pistols and sling shots. Not that I can remember anyone ever actually hitting one of the rodents. We must have been rotten shots!' Sea Breezes  April 2014.